Editorial Board, International Journal of Criminology and Sociological Theory, The Motherhood Initiative for Research and Community Involvement and the Engaged Scholar. At the core of Dr. Minaker’s scholarship are explorations of the tensions between individual agency and social systems and “the power of meaningful connections” in creating openings for personal transformation and social change. Byrd, D., Minaker, J. & O’Reilly, A. (Eds). (forthcoming 2019) Feminist perspectives on young mothering. Bradford: Demeter Press. Minaker J., & Hogeveen, B. (2015) Criminalized mothers, criminalizing motherhood. Brandford: Demeter Pres. Minaker, J., & Hogeveen, B. (2009) Youth, crime & society: Issues of power and justice. Toronto: Pearson. Who inspires you? What cause, issue, or social problem evokes in you a passion for social change? We each have the power to be change makers. Meaningful connections can encourage, foster, and inspire us to create the communities we want to see. I shared some of what motivates my desire to use the post-secondary classroom as a site of possibility and meaningful change in my TEDxUAlberta talk called The Power of Meaningful Connections (March 2016). To say this is a career highlight and milestone would be an understatement. 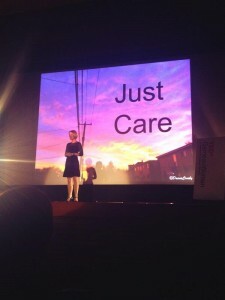 Only a couple of years ago I watched one of my first TED talks – the famous Brené Brown Power of Vulberability TED talk and thought – I can do that…. someday!?! (I hope). It was surreal to watch the video myself and see that I actually did say what I thought I said to that lovely, caring audience one cold Edmonton December night. 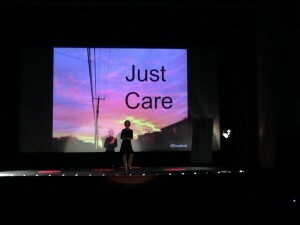 I believe that care is a powerful social justice practice. We all need care, yet so much gets in the way of our just caring for ourselves and each other. I am on a mission to practice, foster, value and humanize care through my work in supporting individuals and groups to have more “meaningful connections” and create more caring spaces in our lives and our society. I promote a new approach I call Care*Full, and hope to inspire others to live care*fully (care-based), rather than carefully (fear-based). This means we engage in practices of self care AND care for others. I am a visionary, and dream BIG! Let’s envision together what a Care*Full movement could look like… are you with me?? Think of the personal and social transformation this could bring about!?!! It’s amazing what a little idea, spread, talked about, discussed, debated, passed around, modified and … you get the picture! It was Martin Luther King Jr. who said “I have decided to stick with love. Hate is too great a burden to bear.” So many actions, reactions, decisions, assumptions we make tend to be based in fear, pain or hate. How different our world would be if we began from the premise that we are all deserving of love, belonging, care and respect. I am humbled by the responses from friends, family, strangers and people near and far who have gained something positive from my talk and my message. Thank you for your willingness to care. 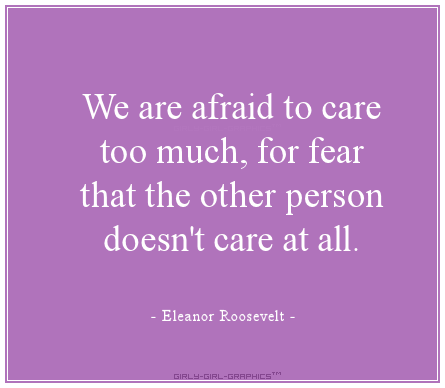 Eleanor Rosevelt said, “Do what you feel in your heart to be right – for you’ll be criticized anyway.” Now that I am getting my head AND heart around care, there is no turning back. Care requires the analyst, practioner and thinker to be fully present. More to come about my new endeavour, Cared Humanity really soon! Watch for details in February. 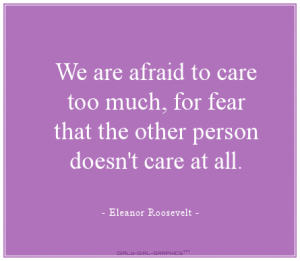 What if, we moved through the fear and just cared anyway? I can hardly believe that one week ago it was TEDx Garneau Women! Let me begin my first post with sharing my gratitude. To my wonderful partner, Bryan Hogeveen, thank you for encouraging me to soar and supporting me through this journey that was “my Ted-talk.” Thanks to the lovely ladies who did more than organize the event. 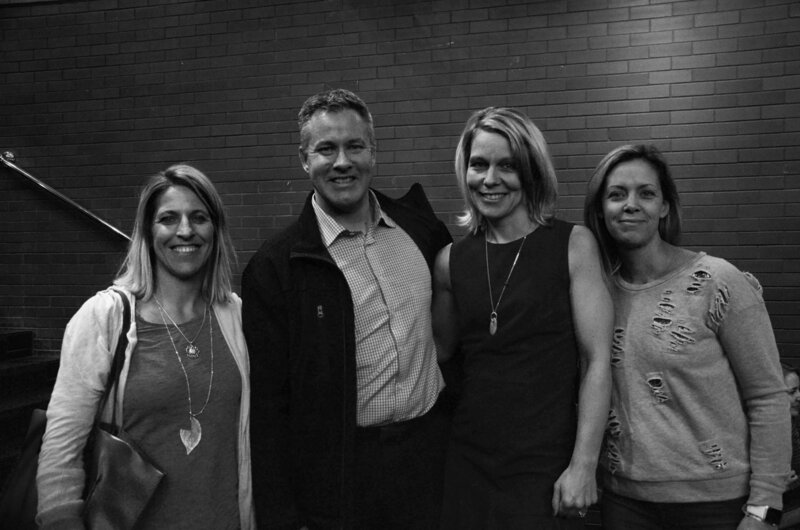 Nicola Doherty and Lori-Ann Claerhout, thanks for asking me to speak at TEDxGarneau Women and for the laughs, the fear calming, and your friendship. Special thanks to my soul-friend Gemma Stone for lending me trust and inspiration when I most needed them. I had a gaggle of caring friends and well wishers in the audience and cheering from a far, including my colleagues in the MacEwan Sociology Department and friend, Céline Nadon and brother Brian Minaker. Thanks to My friend Kelsey (aka Dr. Ford), Rita Chand, Chris Guillebeau, Brianna Olson and Daena Crosby for your care and the special way you contributed to my performance. Huge shout outs to Stay-at-home-feminist Natasha Chiam and Sue Robin’s from Bird Communications for writing about my talk Just Care. For the twitter tweets, telephone calls, emails and reassurances thank you! So many of the people who helped make this possible for me are not on-line, but this post would be missing something without mentioning their names. Thank you Jill Love, Sodhi Pillay, Diane and Bob Minaker, Gerry and the late Tine Hogeveen, and always, I’m so grateful for my children, Ayden, Taryk and Maylah Hogeveen. It was an evening of meaningful connections – new ones with Funmi and Adrian from FO Photography; and Dana Weatherhead from Reel Moments – and ripened ones with my Book Club Ladies (Robin, Tara, Patti, Kelsey). Thanks, Funmi for this wonderful feature and your beautiful photographs! It was an honour to share the stage with Julie Rak and Ruth Kelly. It’s been an exciting couple of months anticipating TEDx Garneau Women and the night is almost here! I am so ready to share my Idea Worth Spreading with you all tomorrow night. 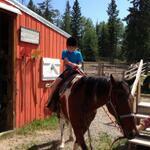 I am still doing interviews with moms in Edmonton. If you feel you are part of this group of young, marginalized mothers or know of someone who belongs within this category, please get in touch. What are we doing as a community to assist and support families at the margins? From Bubble Wrap to Free Range? Is Caring for Kids really about protecting them? You may say you can’t win for trying – “too much” or “not enough” seems to be the rally cry of the day levelled against parents. All kinds of socially constructed ideas, cultural judgements, and labels surround parenting today; including everything from “bubble-wrapping,” slow or “free-range” to “Helicopter Moms” and “Dolphin Dads” (or vice versa). So when I was invited to be a panelist on Alberta Primetime September 20th 2013 to discuss effective parenting, being a mother of 3 and a Sociologist who studies care I accepted. Rather than a debate of polar opposites I think parenting is really more about the everyday care practices that make up our days (and nights!) as parents. It’s about not only what we do, but asking why: What’s behind our actions, our emotions, worries and anxieties about what it means to be a parent? To be responsible for the care, safety, nurturance and growth of our children is a gift not to take lightly and a heavy responsibility. Conversations about children’s safety tend to focus on physical danger and harms in their environment, but the research shows that one of the key considerations in keeping our children safe is his or her secure attachment to loving caregivers. Focusing so much of our attention on the so-called 9 steps to Effective Parenting we may lose sight of the most important part about our parenting role – our relationships with our kids. We can become the most “effective” caregivers if we develop a trusting, meaningful connection with a child. This takes patience, respect, empathy, time and a whole lot of practice. Care is a practice. We learn how best to do it for our unique and special children. What “works” for one, for another – just DOESN’T! Research supports a parenting style called authoritative, described as a blend of warmth and limits, care with discipline. Like our kids, we make mistakes too. We learn through experience what being a parent is about and we try again to do our best for our kids. I believe (and much early childhood literature supports this claim) the most important message we can give our children is a belief that they are loved and loveable, cared for and capable of caring. This happens as we interact with kids, as they get opportunities to learn, to grow, to make mistakes and learn from their experiences. Searching for some exact “how to,” a method we are to use to do this misses the point. Through our bonds with them they can develop a sense of compassion, for themselves and others. A word of caution about bubble wrapping or free-ranging children: Our kids can’t become capable of getting out of harms way if we’re always attempting to take the harm (or potential risks) out of the way. Yet, standing on the sidelines without giving them the tools and skills they need to navigate their worlds we risk raising kids who lack self trust. While dissecting each parenting moment or being too reflexive about what we do and why we do it is not healthy for us or our kids, perhaps taking some time to think about what lies behind our ideas about parenting can benefit our relationships with our children. Raising resilient, responsible, and thriving adults does not happen through any one childcare practice or approach. Becoming who we are as human beings is a journey that lasts a lifetime. I have been thinking a lot about value and the way we socially construct things as valuable, valueless, and how as human beings we engage in practices that de-value not only objects but people. The word value comes from the Latin valēre, which means “to be worth.” Worth derives meaning subjectively. It is not a coincidence that the scholar who encourages us to Dare Greatly and live from a place of worthiness has something poignant to say about value. I have been following Dr. Brené Brown’s work (like many of you) after watching her inspiring TED talks. In this video Brené Brown: GCSW Commencement Address (of her University of Houston Graduate College of Social Work 2013) Brené provides more gems for all of us to remember as we navigate our way through our professional and personal lives. One of these little nuggets that resonated so much with me comes at 5.28. I encourage you to learn more about and from Dr. Brené Brown. What do you think? How does this make you feel? As academics we are encouraged not to ever admit we are not working. No, truth be told, since graduate school we’ve been indoctrinated into the myth that we are and always should be working. This is especially relevant to those of us in the social sciences who live and breathe our societal laboratories. This message [helpful advice/myth-making] we get from inside academia in the form of pressure not to take our earned holiday time and instead pump out the publications. This caution we hear when our internal recordings tell us “with a break from teaching you should be much more productive!” When we add to all this the commonly held assumption that we all “get our summers off” and the defensiveness perhaps characteristic of so many academics (myself included) it can make for a difficult decision to put the proverbial pen down and opt for summer fun and sun. I admit it, somewhat painstakingly. I am an academic and I am on holidays! There I said it. I am taking a few weeks to rest with family and friends. Notice I did not say “off,” as there is always something that gets done (e.g. email here, read chapter there, conversation about…). And, those with children know all too well that family time does not come without its share of obligations, responsibilities and its own workload. But, I digress. I am giving myself permission for self care. I recognize that I will be more productive on my sabbatical if I have actually retreated from my research and writing before forging ahead. I know if I allow myself to bask in the blessings of creature comforts which rejuvenate my mind, body, and soul, then, my work and my life will benefit immeasurably. My name is Dr. Minaker and, yes, I am on holidays.